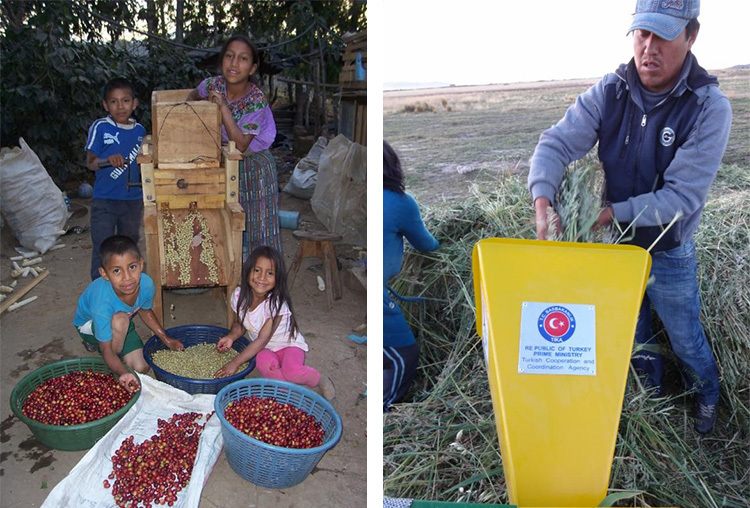 Turkish economic aid to Latin America continues with the completion of three projects in 2017 funded by the Turkish Cooperation and Coordination Agency (TIKA) in collaboration with Strategies for International Development (SID), a U.S.-based non-profit that helps alleviate rural poverty in Central and South America. The objective of the aid package is to help Native American farmers establish successful family-farm businesses in Latin America. Since 2013, TIKA has funded eight projects through SID totaling $341,766. The projects were carried out in Guatemala, Perú, and Bolivia, the three countries in Latin America in which Native Americans are the majority of the population of their country and comprise the great majority of the rural poor. The grants went towards things like wooden and metal coffee huskers to coffee farmers; cattle feed mills and veterinary kits to dairy farmers; and quinoa winnowing, threshing, sorting, and classifying machines to quinoa farmers. The Turkish Coalition of America (TCA) was instrumental in facilitating the TIKA grants to SID and is pleased to have been able to bring the two organizations together to help reduce poverty and make a difference in the lives of families in Latin America. TCA also helped spearhead the funding of a water tank project for Oregon's Confederated Tribes of Warm Springs (CTWS) by TIKA in 2013. The $200,000 grant by TIKA underwrote the cost of two water tanks that serve an elementary school and will help CTWS meet their water needs for ten years.